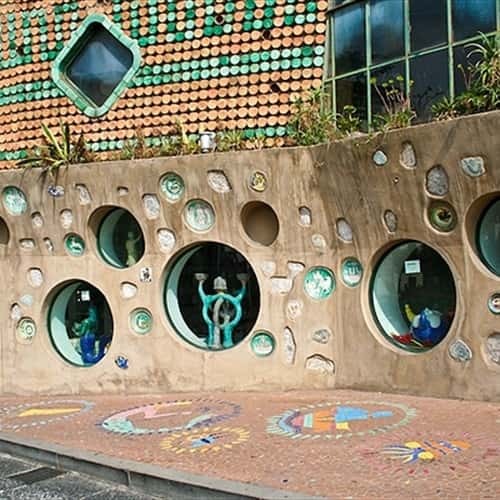 Designed in 1954 by Paolo Soleri, great architect from Turin and student of Frank Lloyd Wright, Solimene ceramic's factory in Vietri sul Mare is not only one of the few works that Soleri succeeded transforming into reality, but an unique example that cannot be classified into a well defined architectural scheme. It was built on a narrow site between a rocky, almost vertical drop and the road that from Salerno leads to the first town of the Amalfi coast, famous worldwide for its ceramics, whose tradition dates back to the Arab world and characterizes the whole landscape of the Divine coast, rich in glittering majolica domes. 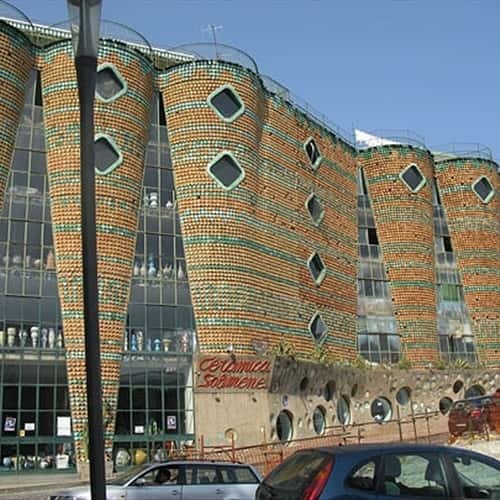 It has an ogival plant, developing in vertical direction, articulated around a helicoidal ramp which leads from the first to the fourth floor of the building, linking - not only in a symbolic sense - all stages of ceramic production cycle. Finished products are displayed and sold on the ground floor while, at higher levels, the various craftsmen are struggling with presses, clay, brushes, nail polish, color and furnaces. 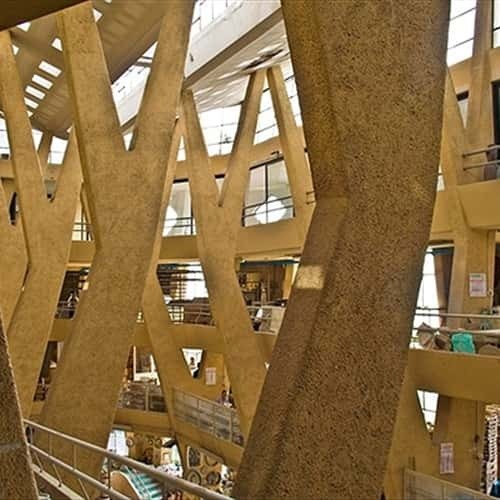 The interior space is flared upwards and dominated by a "forest" of reinforced concrete treelike pillars that support the perforated roof. The façade has a series of inverted conical towers, connected each other by large triangular jutting windows creating a fantastic light game as daring as the components and structure of this building. The volumetric power is given by the polychromatic texture of about sixteen thousand colored vases: modular and essential element that, repeated ad infinitum, replaces a simple and banal plaster and has a high insulation capacity; it also represents the genetic code of genius loci, explaining outside the function of the building. In its dominant position, this work of architecture by Paolo Soleri created a new landscape.